Knitting or crochet? …that is the question!! This week has been a knitting week so I’ve been trying to knit as much as possible as I’m usually in a crochet mood more often than not. It has been a fairly productive week , I managed to knit myself a new wooly hat. I was desperately in need of a new one as my old one stretched far beyond saving. It’s 100% wool and only used up 75 grams of yarn which I was very surprised at. Since descovering Wool Warehouse online just over a year ago I now have a new favourite yarn brand… Drops. They have an amazing website.. Garnstudio. All of the patterns on there are free and they also show you where to buy the best priced products. I have so many unstarted projects which I’ve bought the yarn for because each time I visit Garnstudio I find something different which I just NEED to make. I can safely admit that I have an addiction and I think it may just be taking over my life… quite rapidly infact, but I wouldn’t change it for the world. I LOVE YARN!!! Oh I nearly forgot… I also finished my first ever knitted sock (yes, sock. Not socks because I’ve only finished one. I need to find the motivation to make the other now) using drops yarn of course, I’m rather proud of myself! A week ago I decided I was going to get my bum into gear and actually do sometihng about creating my own business. I’m going to start out on Etsy first and hopefully grow from there. This week I have designed my logo, even though it’s fairly simple and plain I feel it does the job of describing HookLineandGinger (I don’t have any fancy illustration programmes on my laptop so switching between PowerPoint and Paint was the only way to do it! Quite proud of myself really.) I have also designed some labels which will be attached to my products along with care information. Lastly, I made a lino print which will hopefully be printed onto bags and boxes which my products come in- that’s if I can find a good ink to print with. This doesn’t sound like much but I’ve also worked 4 days in the cafe, crocheted, knitted, shopped, exercised and have eaten lots of chocolate!! All in all a successful week I’d say. The last few months of 2015 were slightly hectic with Christmas, waitressing and making crafty things to sell, I didn’t really have any time to do anything else. While unfortunately still working as a waitress, in my free time the begining of this year has been focused on the projects that I want to make. I feel now that I have recharged my creative batteries I can start on my business venture once again (I cannot handle being a waitress over the Christmas period any longer!!!) As of today, I am going to get my head down and focus fully on doing what I love and hopefully being able to turn it into a business that will grow successfully. I first need to decide what direction I want to travel in because I have so many different craft ideas going on in my head, too many to even think about. I’m going to write on here a lot more frequently to let my ideas become a story which I can look back on, well that’s the plan anyway, it didn’t quite happen last time. This year is going to be a lot of hard work and persistance but hopefully it’ll all pay off. You will be hearing from me again very soon. 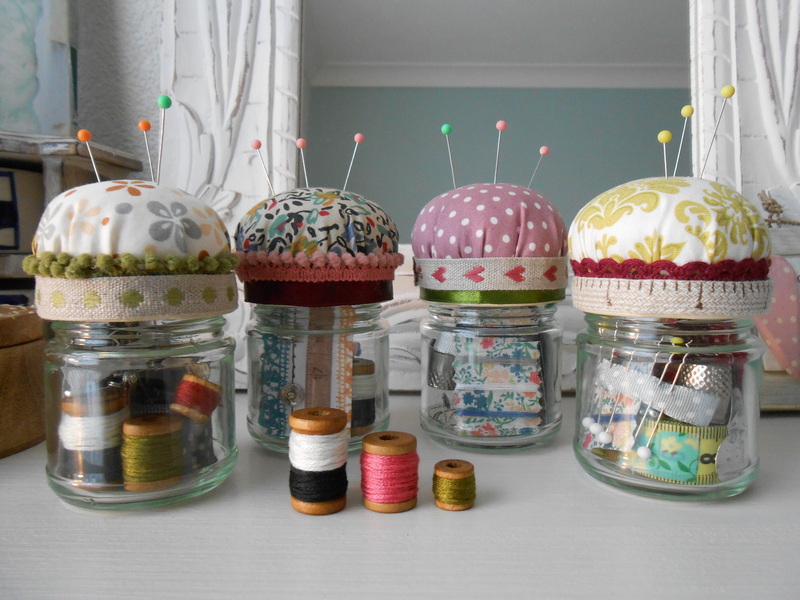 I’ve recently been making some pin cushion sewing jars which I think are perfect for carrying around with you, wherever you go. Each jar is made with a lot of care and detail, I can spend ages deciding which colour ribbons go with which fabric, I’m so fussy. Every jar is unique making them quite intriguing, a perfect gift! I made a variety of jars of all different sizes and patterns, I’m so pleased with the way they look. I can’t stop making them! The jars in the picture are some of the smallest ones I’ve made, the biggest jars each have a pair of scissors and a tin to keep thread in, they range from £4-£6 which I think is fairly reasonable. I hope you like them. 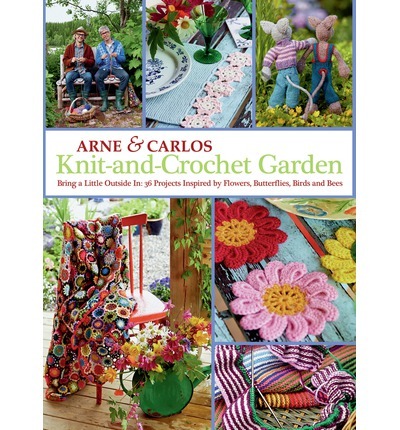 If you’re looking for a beautiful nature and flower inspired knitting and crochet book then “Knit-and-Crochet Garden” by Arnie and Carlos is a perfect buy! There’s 36 projects within the book, all of which are inspired by flowers, butterflies, birds and bees. The images are amazingly vibrant and fresh, giving the book an upbeat and lively feel. 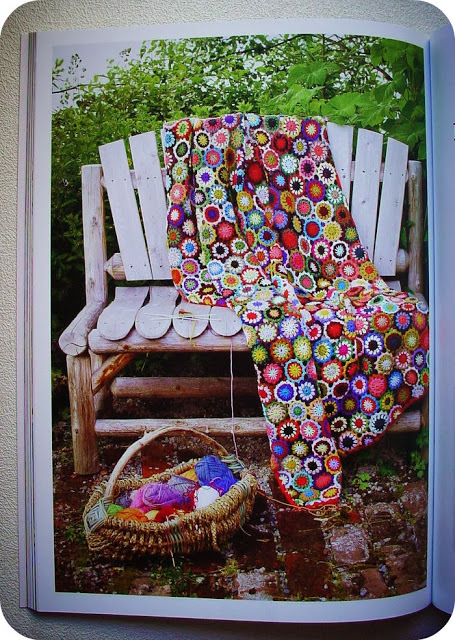 I think every knitter or crocheter would find at least one if not more projects within this book that they would love to have a go at! This project is perfect for using up odds and ends of wool. (and brand new balls that I told myself I wasn’t going to buy but the colours were too pretty to resist) Another great thing about this project is that, if you’re like me and you loathe sewing crocheted pieces together at the end of the project, you can crochet the flowers together as you go! Perfect! 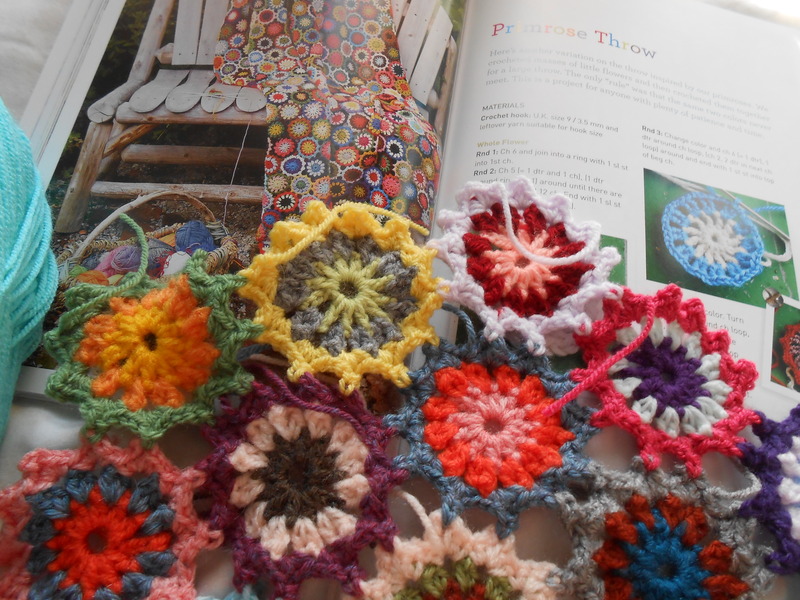 The picture on the right shows the start of my Primrose Throw! I love it already, the random mix of colours are so eye catching, just my cup of tea. It’s a perfect project for putting down, picking up and carrying on from where you left off. I usually have about 2 or 3 projecs on the go at one time but I’m so eager for this Throw to grow that this is my only project I’m working on at the moment. I will probably start a new project before I finish this one but as I have said before, this is a perfect project for putting down and picking up. I highly recommend this book as I have enjoyed looking at every single page within it. If you’re as obsesses with knitting and crochet as I am then I am sure you’ll love the book just as much as I do. If you’re feeling glum on a cold and wet winters day, then flick through these floral pages and by the end of the book, I assure you that you’ll think it’s bright sunshine right outside of your door.